The Canaveral Port Authority has been awarded $1 million in federal funding to bolster Port security programs and critical infrastructure. Port Canaveral is one of thirty-three U.S. ports to have been awarded direct grants by FEMA for FY‘17 which will be used for direct support of maritime security risk mitigation. 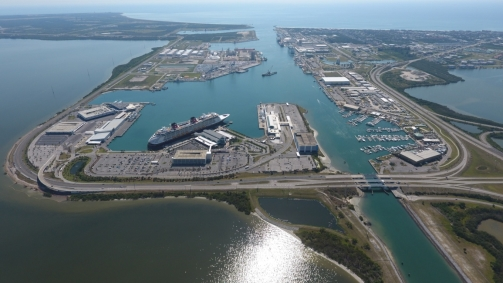 Port Canaveral will use the $999,101 grant award to implement multiple security projects at the Port, including upgrading security hardware, deploying new technologies and cyber security enhancements around the Port. Plans include use of technology for verifying Transportation Worker Identification Credentials (TWIC) to align with soon-to-be upgraded U.S. Coast Guard security regulations. The Port Security Grant Program (PSGP) is a competitive grant program authorized by Congress to support maritime transportation infrastructure security. Funding is made available by the U.S. Department of Homeland Security and administered by the Federal Emergency Management Agency (FEMA) to strengthen infrastructure and support efforts to build and sustain core capabilities. Since the 9/11 terrorist attacks, Port Security Grants have helped the nation’s seaports enhance measures to increase security and protect vital transportation hubs and maritime borders.